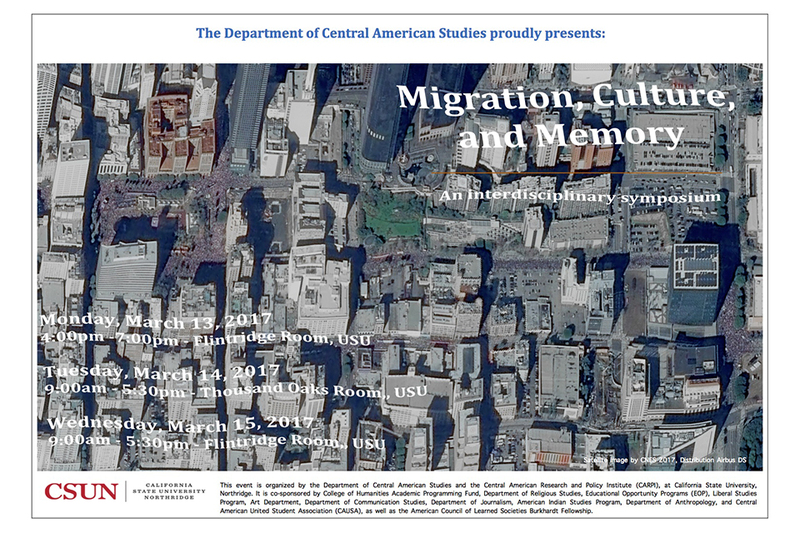 Official poster for the Central American Studies Symposium on Migration, Culture and and Memory: An Interdisciplinary Symposium. Photo provided by Beatriz Cortez, Chair of Central American Studies. California State University, Northridge’s Department of Central American Studies (CAS) will host several events March 14 and 15 as part of the CAS Annual Symposium on Migration, Culture and Memory. The CAS Annual Symposium kicked off on Monday, March 13 in the Flintridge Room at the University Student Union (USU). The inauguration will include opening remarks by renowned Los Angeles activist Angela Sanbrano and a screening of a documentary on the life of indigenous water rights activist Berta Cáceres, who was murdered in Honduras last year. This year’s event will also serve as a networking opportunity for students, according to Beatriz Cortez, chair of the Department of Central American Studies. “The event brings together scholars, artists and activists and gives students the opportunity to engage in interdisciplinary discussions about the transnational dimensions of Central American culture,” Cortez said. Attendees can expect to see a variety of nationalities and disciplines represented at this year’s event, Cortez said. The symposium will continue with a series of panels on migration, art, memory and identities in Central America. These panels will take place on Tuesday, March 14, in the USU Thousand Oaks Room and Wednesday, March 15, in the USU Flintridge Room. Both events will be from 9 a.m. to 5:30 p.m.
Cortez said this year’s event is especially pertinent due to the country’s current political and social climates. For more information, visit the symposium’s website, email Beatriz Cortez at beatriz.cortez@csun.edu or contact the Department of Central American Studies at (818) 677-2736.